Fifty-nine minutes after midnight on this date in 1950, five Soviet cadres were condemned to death in a secret trial on trumped-up charges of treason in one of Stalin’s party purges. An hour later, they were shot. The “Leningrad Affair” saw Uncle Joe — with the urging of other henchmen jockeying for the imminent post-Stalin succession — liquidate the excessively independent leaders of Russia’s other capital. During the late World War, the “hero city” Leningrad withstood a withering 28-month Nazi siege stretching from the very first weeks of war into 1944. I shall always remember how I’d walk every day from my house near the Tauris Garden to my work in the centre of the city, a matter of two or three kilometres. I’d walk for a-while, and then sit down for a rest. Many a time I saw a man suddenly collapse on the snow. There was nothing I could do. One just walked on. And, on the way back, I would see a vague human form covered with snow on the spot where, in the morning, I had seen a man fall down. One didn’t worry; what was the good? People didn’t wash for weeks; there were no bath houses and no fuel. But at least people were urged to shave. And during that winter I don’t think I ever saw a person smile. It was frightful. And yet there was a kind of inner discipline that made people carry on. This horror cost the lives of a million Leningraders, and tour guides will be sure to point out the physical scars still to be seen. But the city never fell, and its resistance wrote one of the 20th century’s awe-inspiring monuments to human perseverance. Dmitri Shostakovich, caught in the city himself, composed one of the Great Patriotic War’s most famous musical anthems, defiantly performed by the Leningrad symphony itself during the actual siege, and broadcast on Soviet radio and around the world. One result of a city’s being carved away from its country — and of consequence to this date’s victims — was that it put Leningrad on increasingly autonomous footing. And as the war receded, the men who administered Leningrad were left with an unusual scope of action … bolstered by their recent reputation for anti-fascist heroism. The so-called “Leningraders” had become an embryonic rival power center. [t]he executions of October 1, 1950, were only the tip of the iceberg … The Leningrad Affair probably claimed more than 1,300 victims, including over 100 who were shot, nearly 2,000 people who were dismissed, and many arrseted. 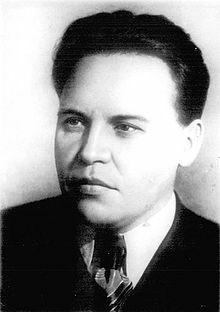 This day’s victims (though not all those persecuted) were officially rehabilitated during the Khrushchev era; responsibility for the Leningrad Affair even served to condemn one of its authors, NKVD torturer Viktor Abakumov, to death in the 1950s.